October 16, 2012 By arzea 16 Comments This post may contain affiliate links. Read my disclosure policy. I saw this recipe last week in Real Simple Magazine and knew I had to make is ASAP. I took a quick picture on my phone, to remind me to search for the recipe online later (how handy! ), and then added it to my Menu folder on Pinterest for this week! This is the kind of recipe where you probably have most of the ingredients in your pantry, and most likely just have to pick up the produce. 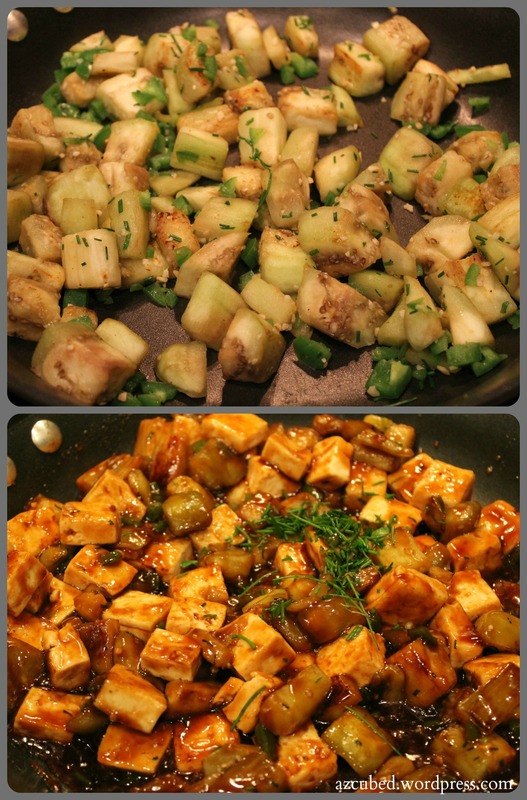 If you like Chinese food (but don’t like all the calories), then this is the recipe for you! It was so flavorful and had the perfect amount of spice. If you are serving this to kids, I would probably half the pepper, instead of leaving it whole. Even with the whole pepper it wasn’t too spicy, it had just the right amount of heat (My husband probably would have even enjoyed more spice). Of course, when chopping the jalapeno make sure you wear your pepper cutting gloves….or get your husband to do it for you (no more pepper hands for me!). I am still paranoid about dealing with these jalapenos after the incident with the Mexican baked eggs…. Anyway, this recipe called for a lot of oil, but I cut it down because it’s not unnecessary I used a technique called ‘dry frying’ the tofu, which eliminates the oil ‘needed’ for frying it. You can still get that crispy fried-like outside that most people enjoy on tofu. 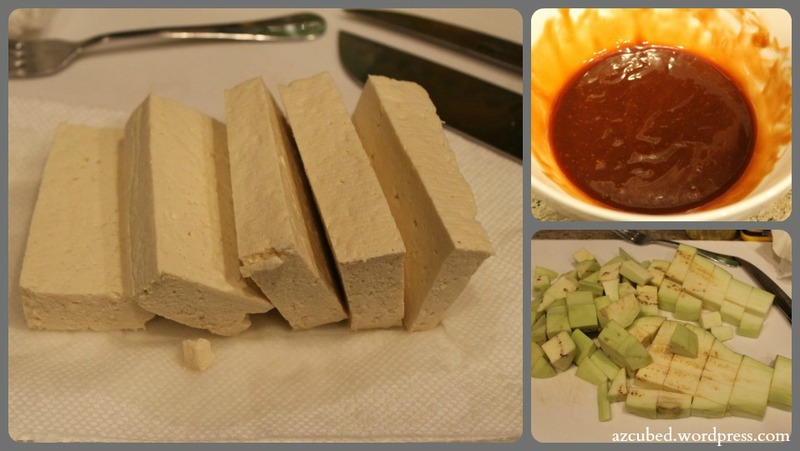 You can visit Melissa Ray Davis for step by step directions on how to dry fry tofu. It’s a very helpful tutorial. Anyway, after the tofu was cooked the recipe went super quick, and it was super easy. You also don’t need a lot of oil to saute the eggplant, because it will soften up without it. I only used 1 TBS even though the recipe called for 3. You can save a lot of calories and fat by cutting this down. I was also super excited to use chives and basil from my new herb garden that I planted over the weekend! Additionally, you could add pretty much whatever veggies you want to this recipe (or meat even). It’s very saucy (yum), and I think broccoli, water chestnuts, peppers, spinach, mushrooms….pretty much anything would be a nice addition. Ok, lets get to it! Cook the rice according to the package directions. In a small bowl, whisk together the hoisin, vinegar, and cornstarch. Meanwhile, in a large nonstick skillet over medium-high heat add the tofu. Use dry-fry method to cook. Add 1 tablespoon of oil to the skillet. Add the eggplant, scallion whites, garlic, chili, and ¼ teaspoon salt. Cook, tossing frequently, until the eggplant is tender, 8 to 10 minutes. 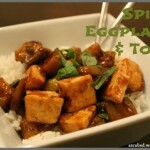 Add the hoisin mixture, tofu, and scallion greens and cook, tossing gently, until the sauce is thickened, 1 to 2 minutes. Serve with the rice and sprinkle with the basil. Tip: Give the hoisin mixture an extra whisk just before adding it to the skillet to redistribute the cornstarch. 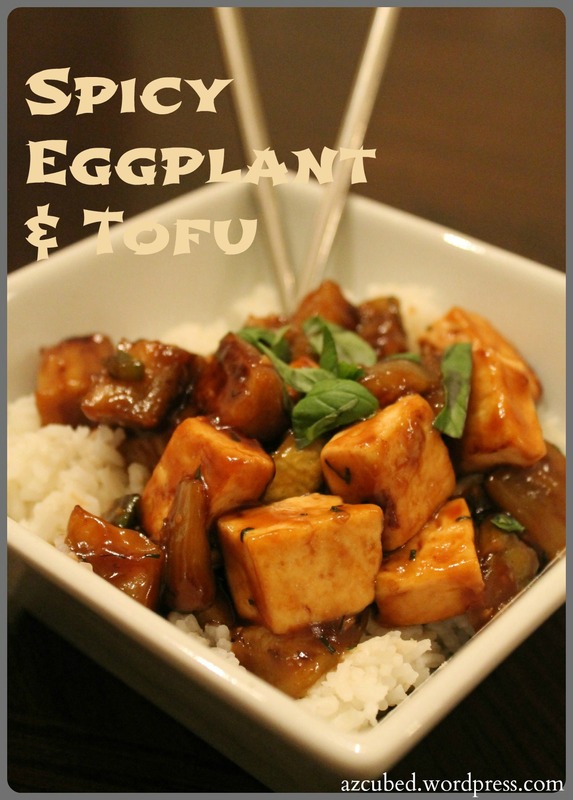 You just changed my tofu making world with the dry fry method. This looks delicious! Congratulations on your new herb garden! Way to go! 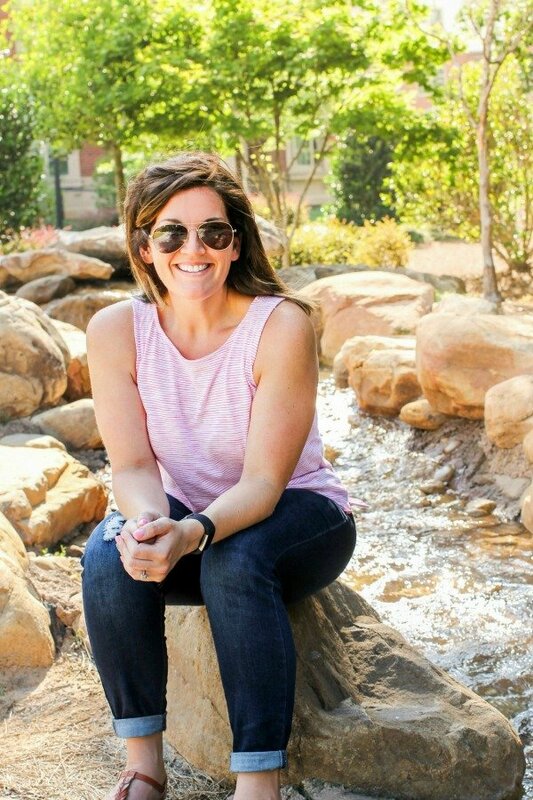 What did you plant? Thanks! I planted basil, chives, and cilantro! I hope they make it though, because its been getting cold outside at night. Maybe I should take it inside?? I don’t know! I love tofu, but aside from putting it in Miso I have no idea what to do with it – thanks!! Yes, this is a delicious and easy way to make it!! I didn’t understand the recipe. When I add the vinager and cornstarch? If you look at the directions, the vinegar and cornstarch get mixed together in the first step. Later in the recipe, step 3, it tells you to add the mixture. Hope that makes sense! Thank you for catching that. I transferred all my recipes over to a different layout and that was probably duplicated in the transfer process. Thank you for letting me know! Thank you for sharing the recipe for a beautiful and delicious dish. I didn’t have a hot pepper so I used cayenne pepper spice. The dry frying of the tofu made a big difference. 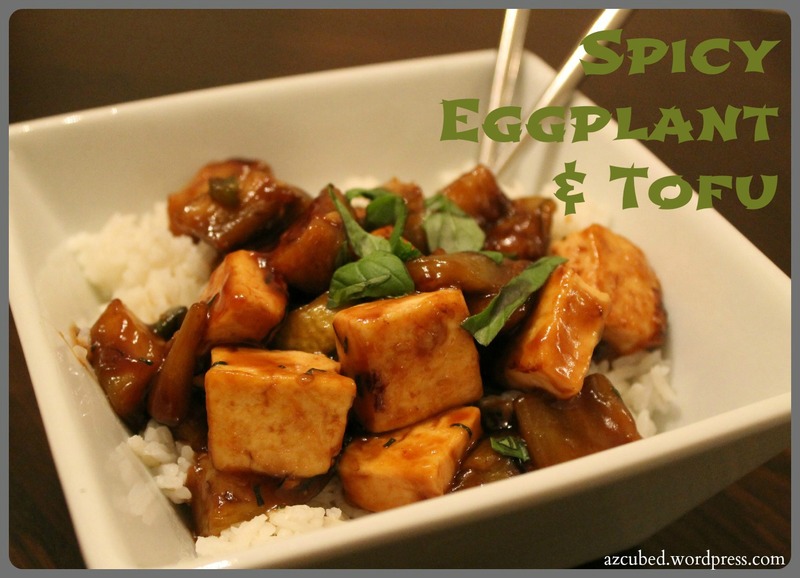 I love that method of frying the tofu, and it works so well! I am so happy you loved this dish – it’s one of our favorite dinners! Will it be okay if I omit the cornstarch? yes, but the sauce will not thicken.